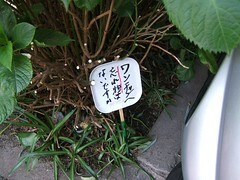 After a long hiatus, I continue my personally beloved collection of the dog doo signs of Tokyo. Pulled from the vaults for your pleasure. 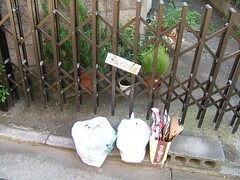 At a house on a Mitaka side street, this sign says "Beware of Dog" above a couple bags of crushed beer cans. That dog's got a drinking problem. In Musashino City. 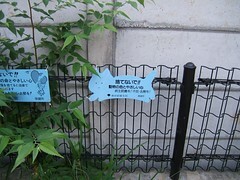 "In the Projects, Dog Walking is Forbidden"
Found in front of a business in Akasaka, across from the Imperial Residence. "To dogs: Please don't leave your belongings behind." 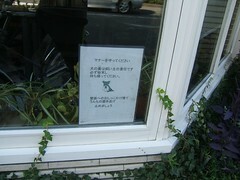 In front of a Mitaka store. "Please mind your manners. Dog poo is the owner's responsibility. Please, you must clean up and take it home. Let's stop spraying pee on the walls and dumping poo." 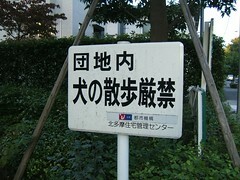 In Musashino City, along Green Promenade perhaps in Sekizen Park. 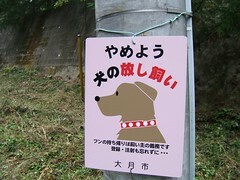 "To dog lovers: Please don't let dogs into the current"
Up in the mountains. On a deserted street leading to a golf course. "STOP! 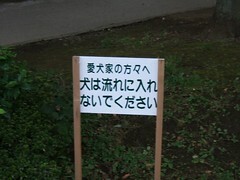 Letting dogs off lead"
In Musashino City. "We're having problems with cat poo. Please mind the rules and your manners. 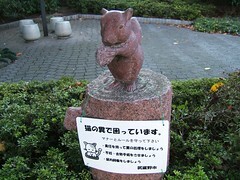 Uphold your responsibility and pick up cat poo. Spay and neuter them. Inoculate them." In Musashino City along Green Promenade. "Don't toss it out!! -- animal life and a kind heart. Inoculate them! Spay and neuter them!"